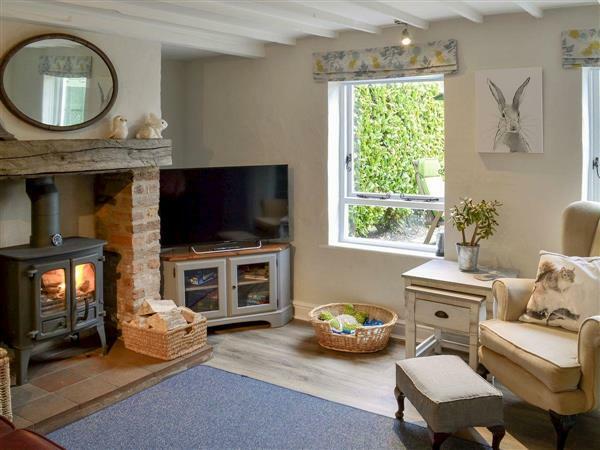 Lockside Cottage in Downham Market, Norfolk sleeps 4 people. Lockside Cottage in Downham Market is a semi-detached cottage, situated close to the Well Creek Canal, which is ideal for fishermen and those looking for a peaceful break with coarse fishing available (licence required). Away from the hustle and bustle of North Norfolk yet close enough to visit the North Norfolk beaches for a day out, enjoy Welney Wetland Centre and nature reserve just 15 minutes’ drive away, or hire a boat on the Norfolk Broads at Wroxham which is just over an hours’ drive. There are good pubs and restaurants in the area within a short drive or maybe walk to the nearest which is less than 2 miles. The Georgian market town of Wisbech is 12 miles away with the nearest train station at Downham Market, just 1½ miles away, with trains running to Kings Lynn, Ely, Cambridge and London for days out. After a busy day exploring the area or simply watching the canal boats motor past the end of the garden, you can sit back and enjoy the private hot tub adjacent to the undercover patio, ideal for al fresco dining at any time of year. The shop, pub and restaurant are 1½ miles from Lockside Cottage in Downham Market. Living room: With wood burner and 32’’ Freeview Smart TV. Bedroom 2: With single bed and trundle bed. Electric central heating, electricity, bed linen and towels included. Initial logs for wood burner included. Travel cot and highchair available on request. Welcome pack. Enclosed lawned garden with patio, garden furniture and barbecue. Hot tub for 4 (private). 2 small dogs welcome. Bike store. Private parking for 2 cars. No smoking. Please note: The canal is 30 yards away. Holidays at Lockside Cottage run from Friday to Friday. Pets allowed at Lockside Cottage. For a better idea of where Lockside Cottage is, you can see Lockside Cottage on the map below. Lockside Cottage is in Norfolk; should you be on the lookout for a special offer, you can find all the special offers in Norfolk. It's always worth checking to see what is on offer at the moment. Do you want to holiday near Lockside Cottage (UKC3202), you can see other cottages within 25 miles of Lockside Cottage; have a look to find your perfect holiday location.